Not a lot to say that wasn't said last week when it comes to our local equities market other than we are now approaching some resistance levels. The first level is 5950 as you can see on the daily chart is but a day away. The next level is 6000 which is where you will find the 200-day moving average. 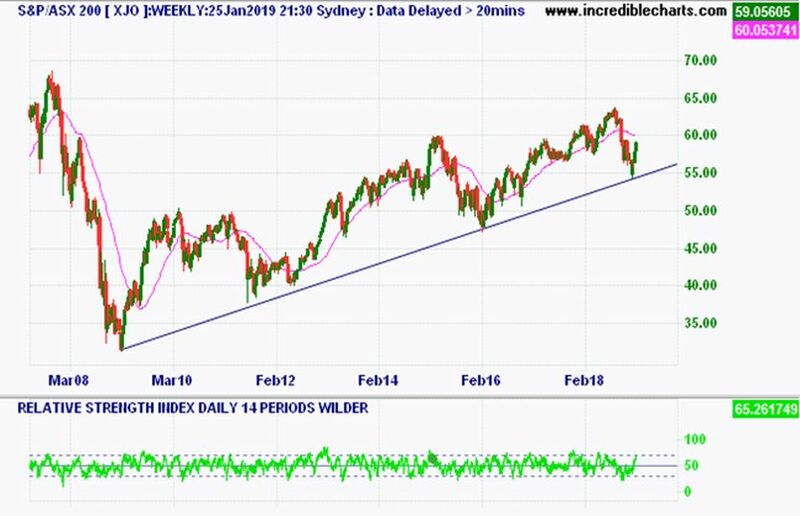 A positive sign is the 200-day moving average has just flattened and if you were an uber optimist then you might even note a slight turn upwards. I don't believe the 5950 level will provide a lot of resistance however the 6000 level might be another issue. One other indicator that is widely used is the 40-week moving average on the weekly chart. A bullish trend usually sees the lows hitting the 40-week moving average and rebounding and vice versa with a bearish trend. Over the long term a break through this level is a very good indication of a change in trend. 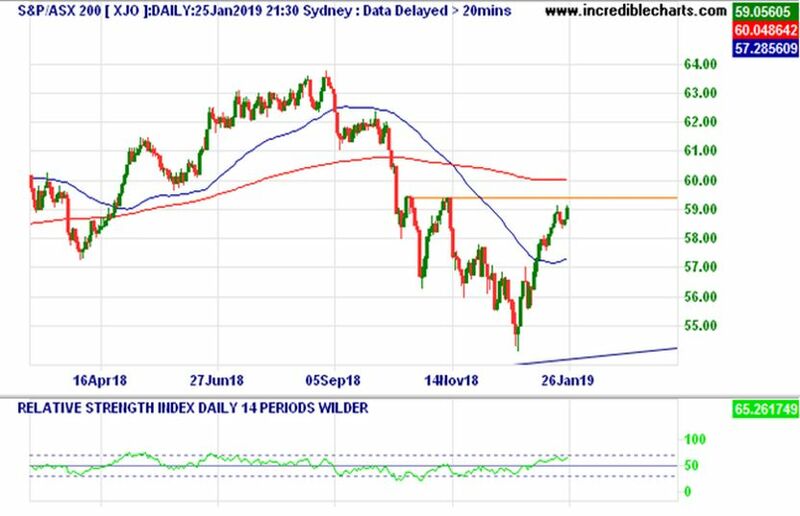 As you can see it was broken through to the downside back in October so now the interesting move to look out for will be whether it can break through to the upside or find resistance. Resistance would be very negative and suggest the previous lows could be re-tested. I get the feeling the medium term is going to be a serious tussle between the bulls and bears with no clear direction. Away from the overall market and on the positive side the local Banks and emerging markets have provided some good buying opportunities having been in oversold territory for some time. 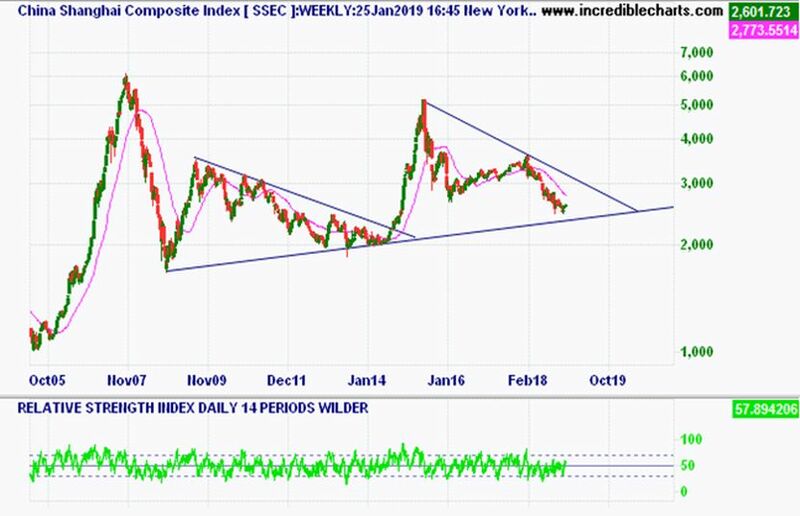 Especially China which is nearing the bottom of a second pennant pattern in 10 years after a recent 30% drop from its high a year ago. If you are into Investment behavior and psychology, then generally the best time to buy is when the news is dire and the news on China is all dire of late. Never bad for the long term to buy on a 30% drop. Just think you are 30% better than the poor investor who bought at the top and add the fact that the market must go up 42% to recover their loss. Enjoy your week!